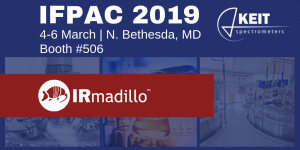 Meet us at IFPAC 2019 (4-6 March) in North Bethesda, Maryland (Booth #506). We’ll be showcasing our compact, on-line mid-infrared spectrometer, the IRmadillo. Learn more during our presentation on Tuesday 5th March at this leading process analytical chemistry meeting in the US focused on innovations and technology. Right at our booth we’ll show how easily our IRmadillo real-time process analyser works to monitor chemical reactions – from differentiation of multiple sugars, to determining alcohol and acid concentrations in a complex process. Get to talk to our Lead Application Scientist about the new models of probes adapted to different industrial chemical environments: from a diamond ATR suited to high pH environments to our high temperature probe, and a probe developed for sterilise-in-place (SIP) procedures. Can’t Make it to IFPAC 2019? There are lots of opportunities to connect with us. Click on our Events tab for an updated list of all the places we’ll be. Or, follow our updates on LinkedIn, and Twitter. Have any more questions? Contact us by submitting your information in the form below. We will keep your information only for the purpose of responding to your question if requested. Your information will remain private and will not be shared. Can you tell us more about what you'd like to measure?